Notes: A (small) Big Stopper (ND 3.0) arrived in the post today, to fit my Panasonic zoom lenses. An unexpected burst of sunshine this afternoon prompted me to rush over to Paper Mill Lock to try it out on some slow water shots. Having made a few I was pleased with, I took a walk further along the canal and came across a Twitcher stalking a bird across the water with an enormous Canon lens. 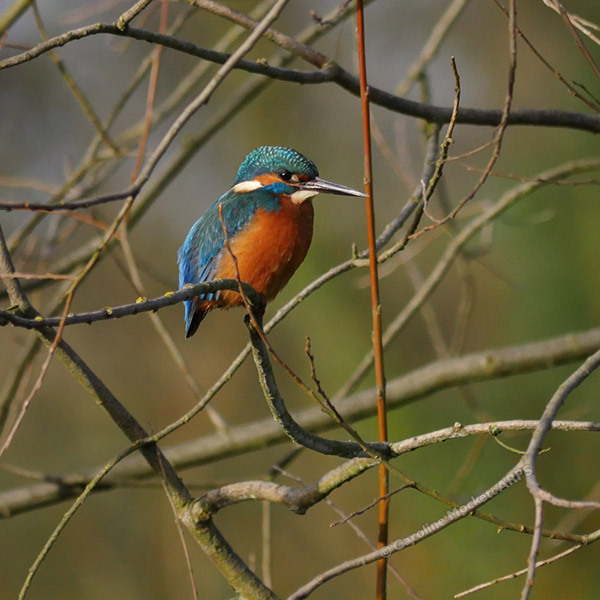 It was a Kingfisher. It soon flew off and landed on some branches not far from me. I hastily changed to my longest zoom (a 600mm equivalent at the long end) just as the sun came out again, making it pop from the background. Wow. I was so pleased. I’ve never seen one before. Just yesterday, I made a comment on a Flickr friend’s Kingfisher photo that I would love to even see one, let alone take a picture. And less than 24 hours later, it happens! Perhaps I should wish for things more often! Perfect for Treasure Hunt Theme #72 – Wild.